Today we are gathered here among our cousins, aunts, uncles, nieces and nephews to celebrate the tradition called Black Thanksgiving. We have already informed you about the invited guests, so you should be familiar with all of the people in attendance. Black Thanksgiving is a holiday based on family and love, but it is mostly about the crisp edges of the macaroni. It is about the fluffy heft of sweet potato pie. It is about the food, but you already know that. Now we must engage in the final and most important part of this cultural feast: the giving of black thanks. You can offer praises to whomever you wish—Jesus Christ, the ancestors or the great macaroni-maker in the sky. It doesn’t matter because they’re all black. We give black thanks to Big Grandmama (I think white people refer to big grandmamas as “great-grandmothers,” but Big Grandmama says referring to anyone as “great” is not pleasing in the sight of the Lord). Big Grandmama retired from the kitchen two decades ago but surprised everyone by coming through with a single pan of the old-school macaroni with the secret ingredient that she refuses to share. I’m sure her unknown element is either goat-milk cream or the actual blood of Jesus. We give black thanks to Uncle Junior for taking the trek to his car, opening the trunk and fishing the bottle of brown liquor out of the wheel well every 45 minutes as if everyone doesn’t know what he’s doing. Everyone knows ... except for Aunt Junior, who’s saved, sanctified and filled with the Holy Ghost. Black thanks for the smoked ham, the only part of a Black Thanksgiving meal that is allowed to be store-bought. We all remember that one time LaTonya brought a pan of greens from Boston Market and tried to pass them off as authentic, but Big Grandmama could smell the whiteness as soon as she opened the aluminum foil. LaTonya had to sit at the kids’ table for eight years after that. Black thanks to the white girl with the single teardrop rolling down her cheek experiencing multiple orgasms after she tasted Big Grandmama’s macaroni. I can tell she wants seconds so badly but is afraid to ask. Big thanks to Uncle Junior, who is full, drunk and mad because they won’t let him watch the Cowboys game. Uncle Junior says he served in Vietnam and says he doesn’t care if Colin Kaepernick took a piss on the 50-yard line during the anthem because no one who ever fought in the military did it for a goddamn song. That might just be the liquor talking, though. Black thanks for those secret hiding places where everyone hides their to-go plate because I eat Black Thanksgiving food for two or three weeks. I keep dipping in my plate until the turkey starts to smell like roadkill. Then I eat for two more days and wonder why I have chronic diarrhea. Must be the changing of the seasons. Black thanks for our favorite cousin. My only hope for humanity is that we all will someday find someone who permanently makes our hearts feel that same flutter of joy and butter-flavored sunshine that we feel when the car carrying our favorite cousin pulls in the driveway. Black thanks to the newest baby in the family, who gets passed around to every single person. Someone is going to eventually say, “He looks just like your Aunt Bessie when she was a baby,” but you’re having trouble remembering which aunt is Bessie because all aunts start looking the same after a while. Black thanks to that part of the evening when they put on some music and your cousin shows your Aunt Junior how to do the Wobble. Black thanks to the 12- to 15-year-old nieces and nephews who scowl because they have kitchen duty. They will be in there all night laughing, joking, not knowing they are becoming someone’s favorite cousin. Black thanks for the aunt who keeps asking about the top to her Tupperware container and makes the entire family go on a scavenger hunt to salvage $1.29 worth of plastic. Black thanks for the impromptu niece-and-nephew talent show. Black thanks for that part where you have to hug all your cousins, nieces, nephews, aunts and uncles before you leave. Black thanks to Big Grandmama, who insists you take the $5 she’s trying to give you. Black thanks to being a little sad as you ease out of the driveway, leaving your family behind because you know you won’t see them for a while. 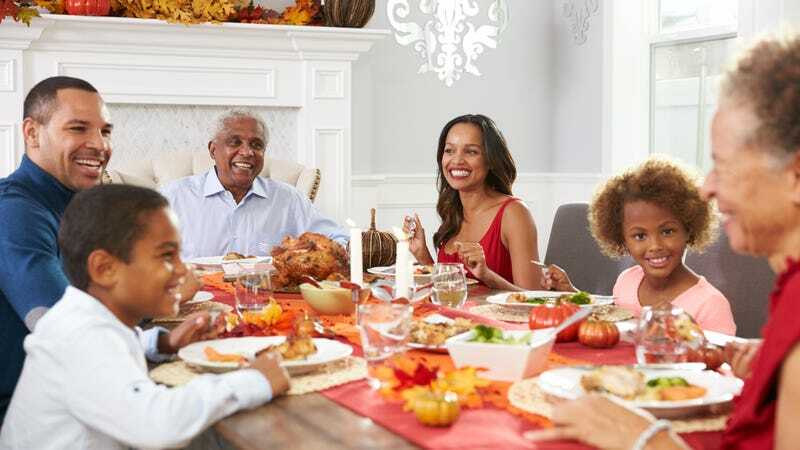 You’re missing them already even though you can still feel the love of Black Thanksgiving in your heart and soul. Mostly in your belly, but there’s some in your heart, too. No, it’s not acid reflux! It’s love. OK, maybe it is acid reflux a little bit. You left your damn plate! Happy Black Thanksgiving to all! Rest in power, Gina and Akeem.